The Cleveland Cavaliers snapped a four game home losing streak after defeating our struggling but beloved 76ers 101-93. The Cavaliers attacked the 76ers from all angles with five double-figure scorers including Antawn Jamison, Joey Graham, Daniel Gibson, Jamario Moon and Anthony Parker. This is now the second time this season we have lost to the weakened Cavaliers without their former franchise star — LeBron James. Also, absent for Cleveland was point guard Mo Williams who has averaged 14.6 point per game. The 76ers who were again without “star” shooting guard Andre Igoudala, dropped to 2-9 on the season and 1-6 away from home. This loss marks the end of a five game road trip which the Sixers came up with only one win, against the New York Knicks on November 7th. Now we return home for the second half of a back-to-back set, as tonight the Sixers host the Raptors. A major issue for this team has been starting games slowly in the first quarter. Against the Cavaliers this was not an issue as the 76ers ended the quarter with a 23-19 lead. We were struggling to attack the rim but still managed to get solid production from the wings. Andres Nocioni and Evan Turner posted seven points a piece in the first. We continued to fight in the 2nd quarter and saw an unfamiliar face crack the lineup. Power forward Darius Songaila saw the floor for only the second time all season. It was an interesting move on head coach Doug Collins’ part, usually we see center Marreese Speights or Elton Brand (with a smaller lineup) open up the 2ndquarter. Songaila got off to a rough start, immediately being beat on a backdoor cut by Ryan Hollins for an easy bucket. The Cavaliers made it their scheme to attack him in the middle as they kept penetrating the paint in the 2nd. However, Songaila’s scrawny frame battled with their bigs and put together a solid effort offensively. Songaila ran the floor well in transition and finished a pretty layup off a Lou Williams pass. He also contributed with an offensive board and put back to put us 40-37 midway through the third. The Sixers held a small lead throughout the second until late. The Cavaliers put together a 7-0 run and both teams went into the half tied at 54. The turning point of the contest was with 8:37 in the third quarter remaining the Cavaliers went on an 11-0 run to top the 76ers 72-61. The game continued to slip in the third as we gave up four uncontested three pointers and got outscored by 10. Don’t want to pin the loss on Igoudala’s absence, but we need a go-to scorer of his stature when things are going sour. In that situation there were too many 76ers standing around looking oblivious and waiting for at teammate to do something. With Iggy, we at least have someone to lean towards for assistance. We trailed by ten in the fourth quarter and never made a true threat of overtaking the game. Evan Turner struggled late with a few bad sequences involving an out-of-control missed lay-up attempt, a traveling turnover and bricked three-pointer. The Sixers never could kill the home momentum the Cavs were feeding off of. The Cavaliers only committed eight turnovers the entire game. They went over 35 consecutive possessions without turning the ball over. On the road if you want to have any chance at stealing a victory you need to force turnovers to win. Defensively we could not get that done on Tuesday night. On offense the home team capitalized off our mistakes and scored 19 points from 15 turnovers. 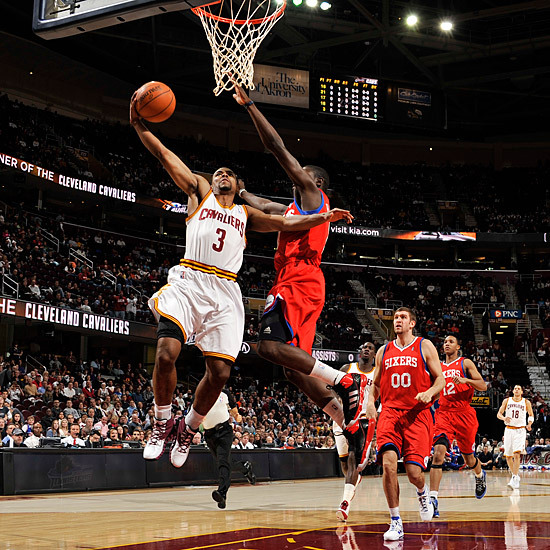 The Cavaliers also outscored us in fast break points 20-12 and put up eight more points in the paint. We have to start winning these battles as a ball club if we want to improve on our dreadful start. We are not a good shooting ball club and are limited in our ability to stretch the perimeter. What we do have is an athletic group who can attack the rim. We must limit the opportunities we give to other opponents in transition while maximizing our own. Returning home after a five game road stand will be refreshing. Toronto and Milwaukee join us in the next two matches and both are beatable opponents. Hopefully, AI9 will be ready to rejoin his struggling teammates soon. Of course, NBA.com has highlights of the Sixers 4th straight L.